Do you know about the free resources available to assist you in filing? Volunteer-led free tax prep is available all over Minnesota! 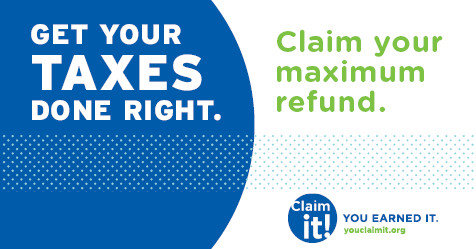 Find a site near you: youclaimit.org/find-a-free-tax-preparation-site. File your taxes online for free! If you earned less than $66,000 in 2017, consider filing your taxes online for free using www.MyFreeTaxes.com. MyFreeTaxes provides free federal and state tax preparation to individuals and families.